About 250 people packed into the city council chambers for the hearing on a nondiscrimination ordinance. A proposed change to an existing nondiscrimination ordinance that has riled folks up in Charlotte and surrounding towns for well over a year came to a head last night, with the Charlotte City Council voting 7-4 in favor of adding sexual orientation and gender identity, among other things, to the list of traits currently protected from discrimination in restaurants, taxis and public restrooms. The vote came despite Governor Pat McCrory's warning on Sunday that a vote of approval for the changes to the ordinance would bring "immediate" action from the state legislature, which ultimately has control over municipalities like Charlotte. The Republican-led legislature could place the issue on a referendum for vote or it could simply strike down the entire provision. About 120 of the 140 people signed up to address the council before the vote spoke in a public forum that lasted just under three hours. 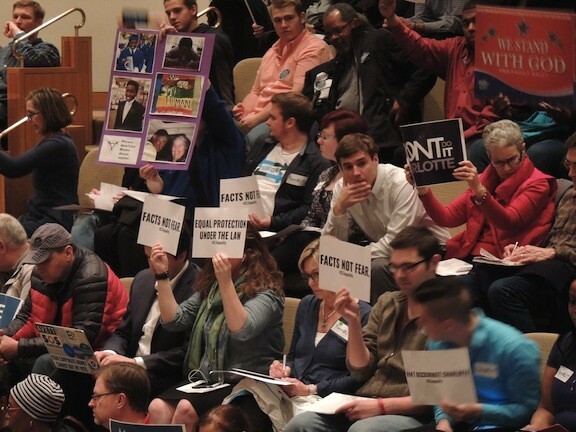 The 80 people who lived in Charlotte were split pretty closely down the middle in terms of being in support of or against the proposed changes, while those who came from out of town seemed to lean toward the opposition's side. Tami Fitzgerald, executive director of the North Carolina Values Coalition, addresses a rally against the ordinance. 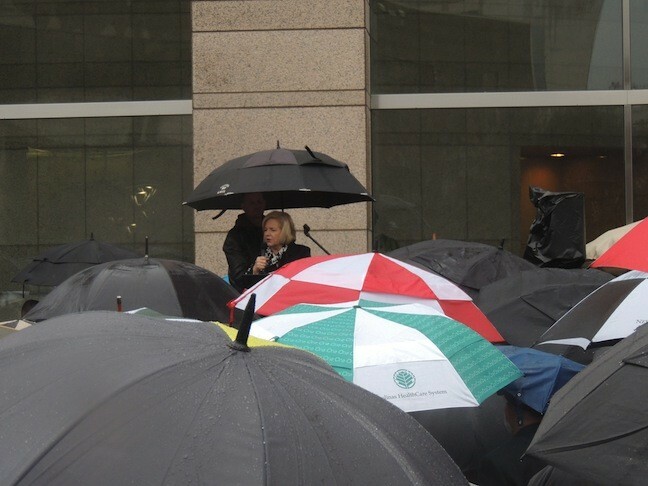 Outside of the Government Center in the lead-up to the meeting, groups opposing the ordinance changes rallied in the rain, taking turns addressing the crowd of more than 100 with a loudspeaker as they stood under umbrellas, many wearing neon construction vests that read "Billy Graham Crisis Response" on them. Inside, a diverse group of people filed in to speak to council and the chamber, which was packed full with 250 people. Some near the beginning went a little extreme, with the first speaker of the night implying that public bathrooms would soon need human kitty litter stations for people who identified as cats. For the most part, however, the dialogue remained relatively respectful and both sides of the debate were able to get their points across. Erica Lachowitz, a transgender mother from Charlotte, told her experience of being assaulted because of her gender identity. "I have an issue, and that issue is with knowing what being discriminated against is really like," she said. "I've had ribs broken and I've had my face smashed into a wall. I've been kicked out of restrooms, embarrassed and made to feel like less of a human. The police response? 'This wouldn't have happened if you weren't dressing like a woman." Elaina Smith of Charlotte voiced her concern, shared by many who spoke in opposition at the meeting, that predators would use the ordinance as a way to legally stalk women and children. "We are not saying that transgender people are predators, but what we are saying is that there are countless deviant men in this world who will pretend to be transgender in order to gain access to the people they want to exploit," she said. Smith pointed to an incident in Seattle earlier this month in which a man went into a woman's bathroom and removed his boardshorts after a similar law was passed there. That man, however, was believed to be protesting against the law and was not transgender nor did he attempt to attack anyone. There have been no reports of raised threats to women or children in bathrooms in any of the more than 200 towns and cities around the country that have passed similar laws. Before the vote, council members had their chance to voice their thoughts on the issue. Council members Ed Driggs and Claire Fallon, who both voted against the ordinance, said they would support an ordinance protecting LGBT people from being discriminated against in restaurants, taxis and the like, but could not get behind the section that prohibits discrimination in public restrooms. Fallon made the odd statement that she believed the council had only heard from one side throughout the night, and not from the opposition, despite the fact that more speakers were opposed to than for the ordinance. Council member Kenny Smith said he believed the entire forum was a sham because council members had already made up their mind. Council member Al Austin, who is openly gay, spoke first and gave one of the more impassioned speeches of the evening. "LGBT people are not aliens who landed here recently demanding their rights. We have been here for a long time," he said. "There's been a lot of talk about God tonight. The God I know is a God of love. He is not a God of fear or hate. God is love. Maybe we need to all understand that." The speech drew cheers from the supporters remaining in the chamber. Newly elected council member Julie Eiselt voted in favor of the ordinance as well, and said the city was making a choice between legalizing discrimination or prohibiting it. She also took a crack at some of those who had preached to the council that night about the fire and brimstone they would experience for passing LGBT-inclusive laws. "I'd like to make a note about religion," Eiselt said at the end of her speech. "If I think about this as a church and I was visiting your church tonight, I would never come back."